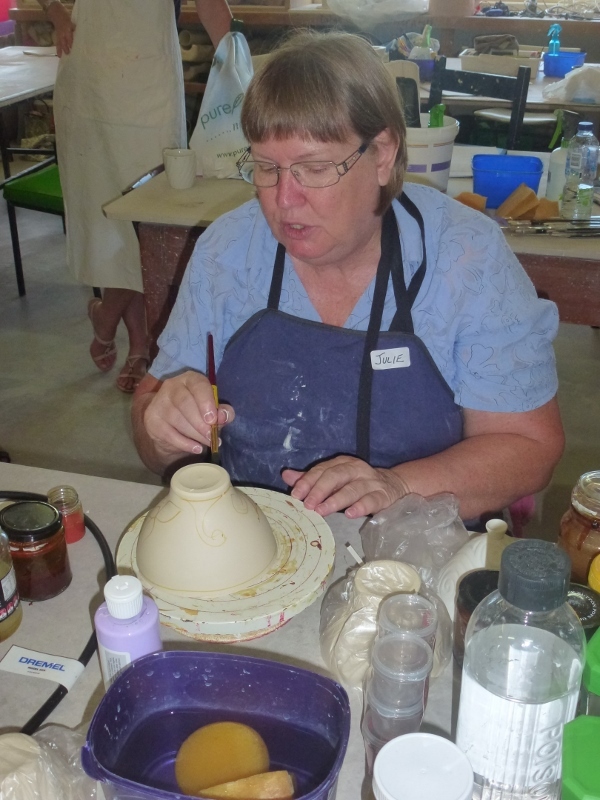 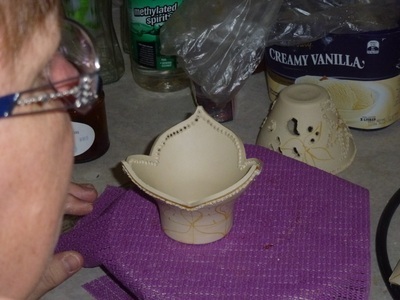 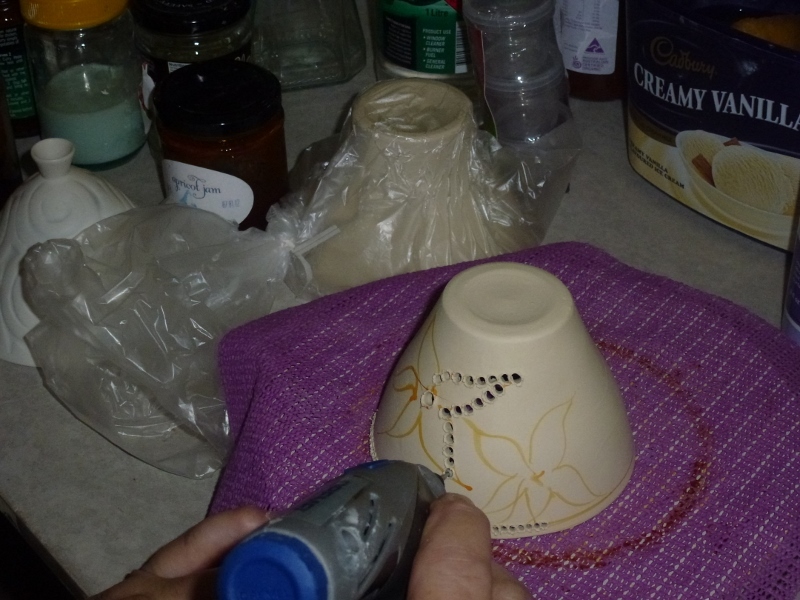 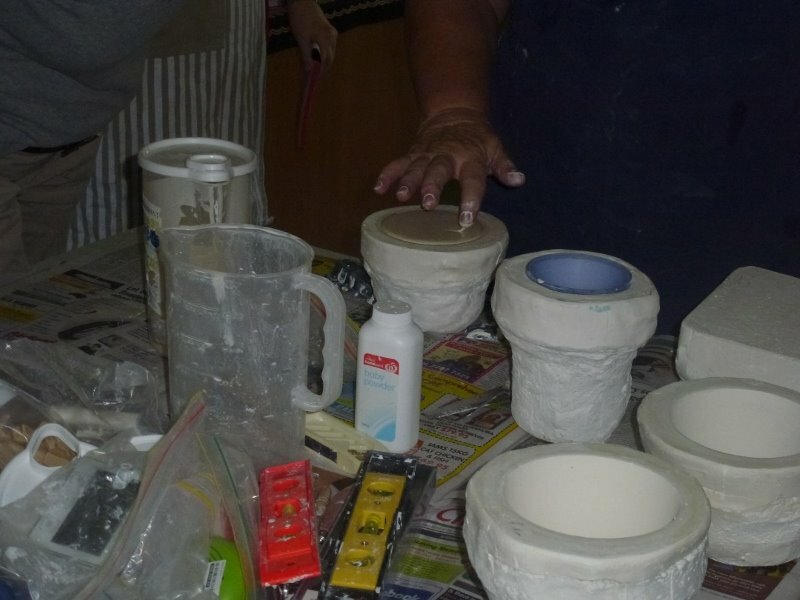 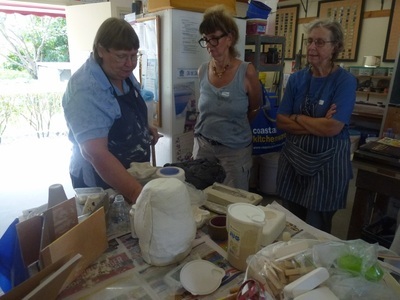 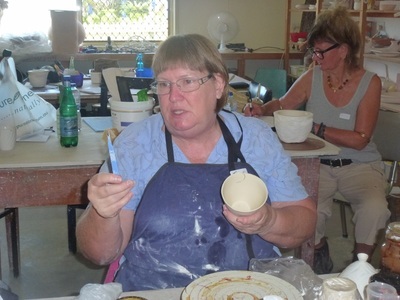 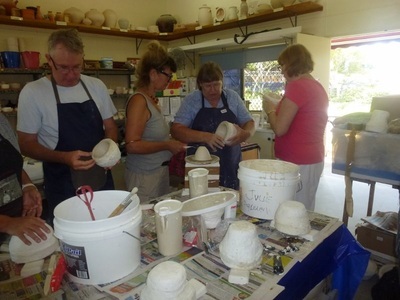 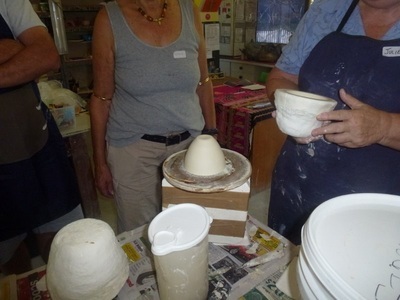 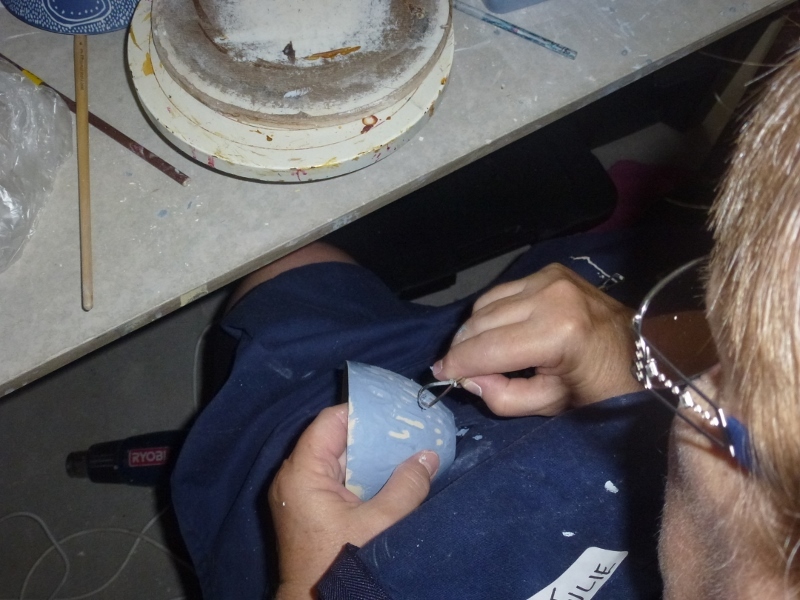 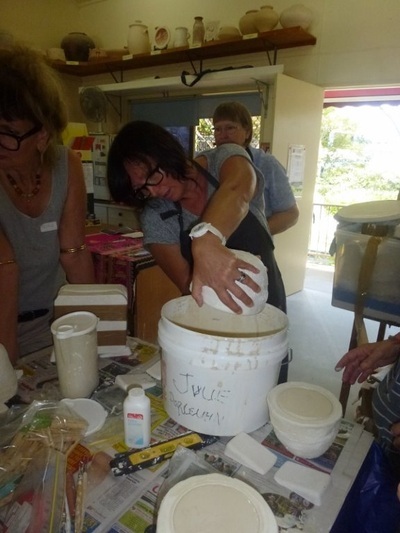 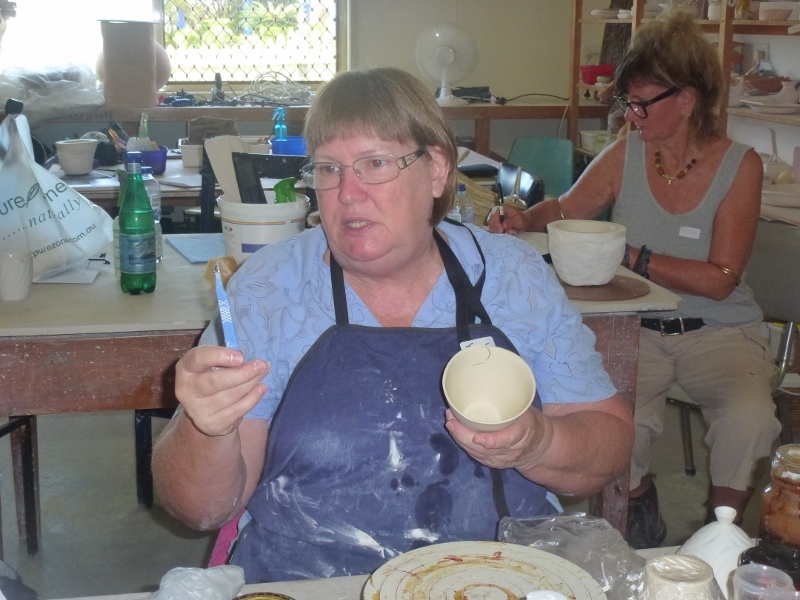 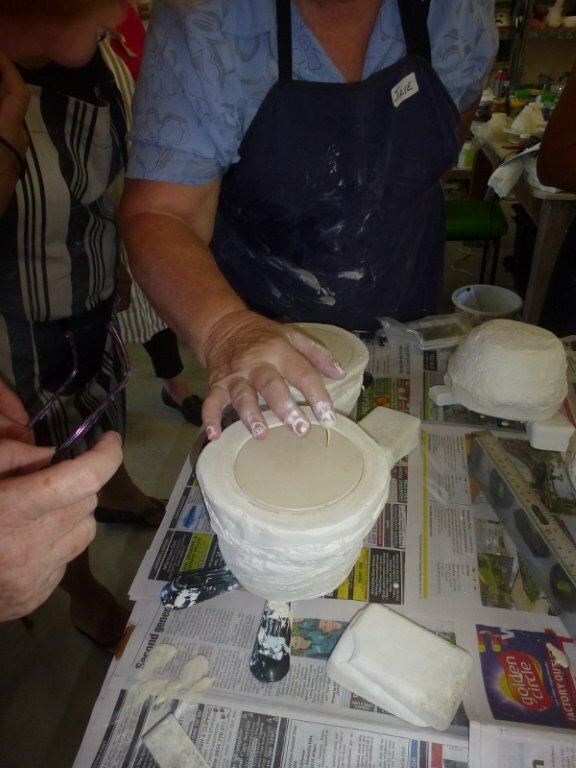 Julie makes her own porcelain slip by using a bag of clay....she marks the 10 litre line on the inside of a bucket, adds 2 litres of water to the bucket, then adds 2 dessert spoons of dispex and 2 of sodium silicate to the water. 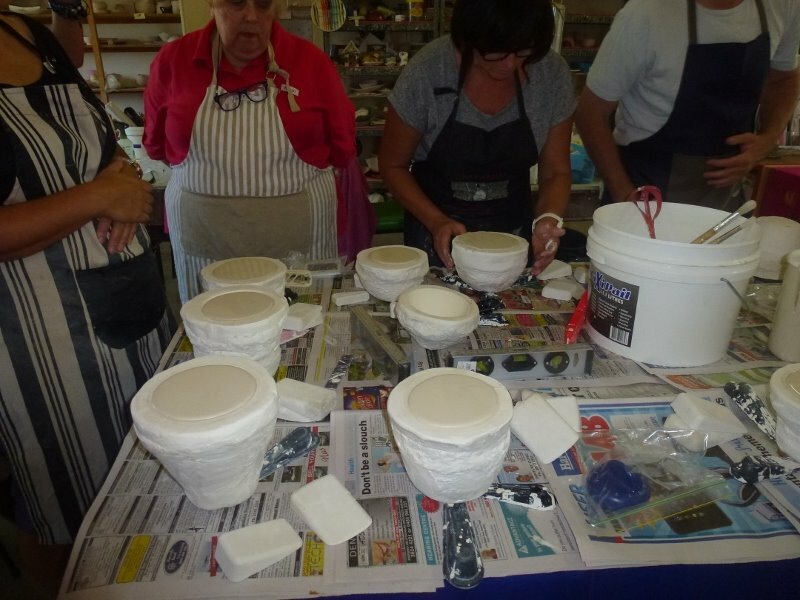 Then she proceeds to slice the bag of clay in thin strips and places them in the bucket, till the clay/water is to the 10 litre mark(usually 13kg of clay needed). 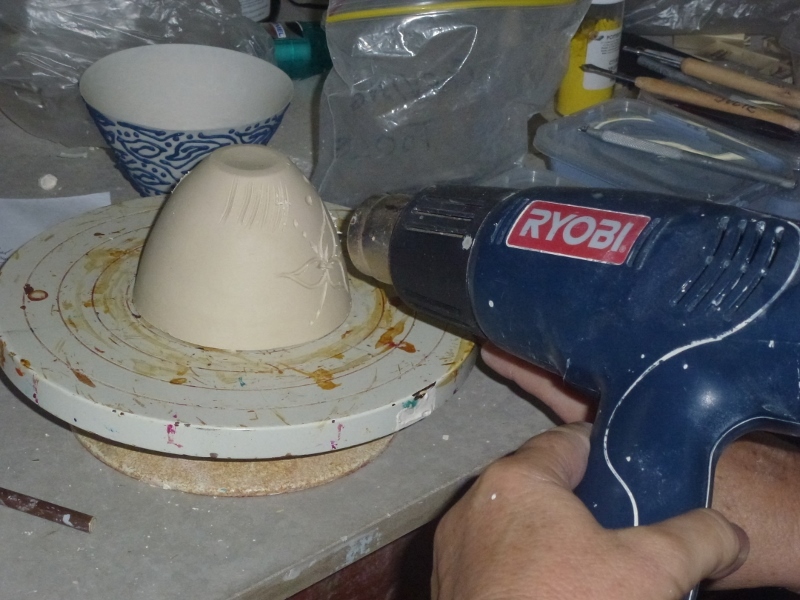 She leaves the clay for two hours and then uses a metal paint stirrer on a drill to mix, making sure to get all lumps out. 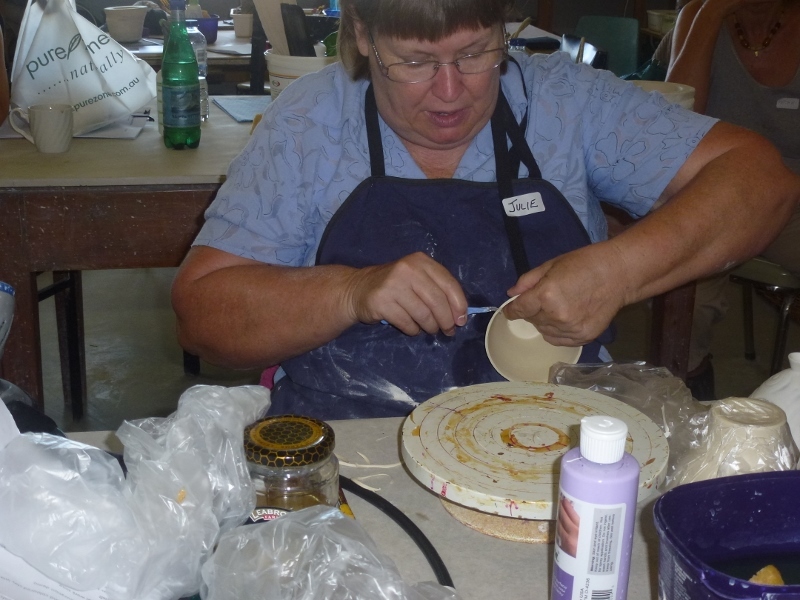 Then she sieves the slip twice in a 60# or 80# sieve. 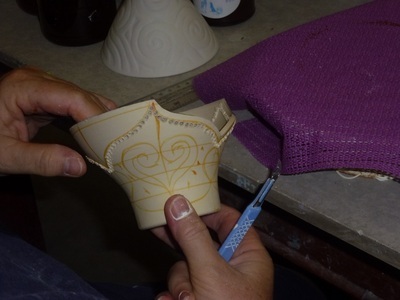 The slip is ready to use if it forms a web between your fingers when you dip your hand into the slip. Ensure your mould is level.....we used door stoppers to level out the moulds. 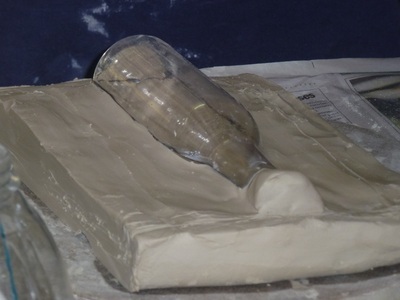 Pour the slip into the mould smoothly in one even pour. 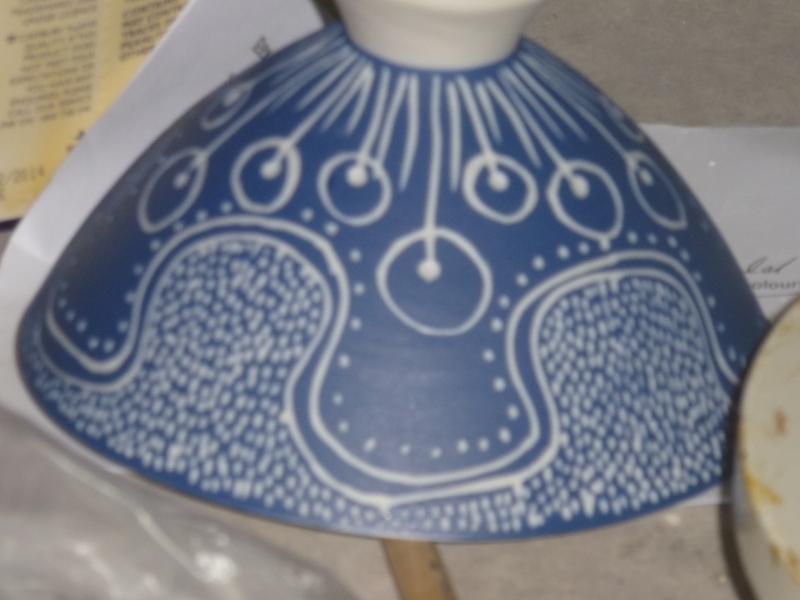 Set the timer to the no. of minutes you need to leave the slip in the mould. Pour the slip out of the mould, then balance the mould upside down, supported off the surface, to allow it to finish draining. 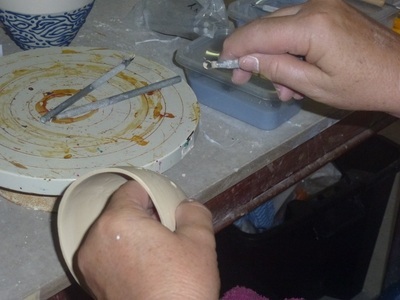 After 10 minutes turn the mould up and trim the top edge with a sharp blade, as soon as the wet sheen is off the clay. 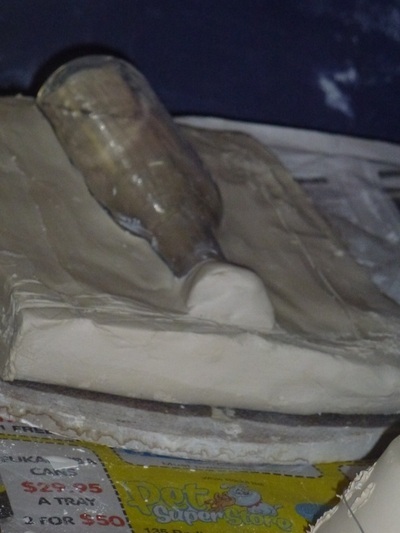 After the cast has dried to leather hard it will shrink away from the mould, you can put the mould upside down on a bat, and tap the mould to make it release. 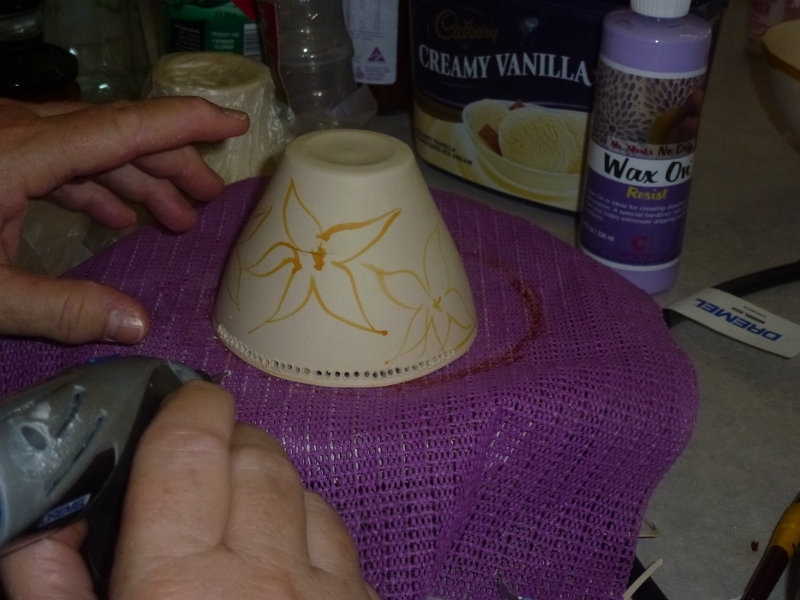 Use watered down coloured inks to mark out your design. 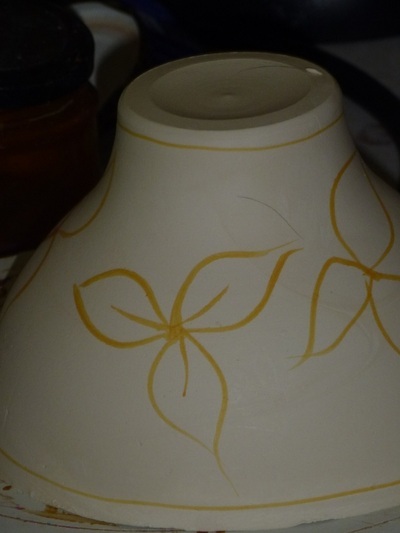 These marks fire out. 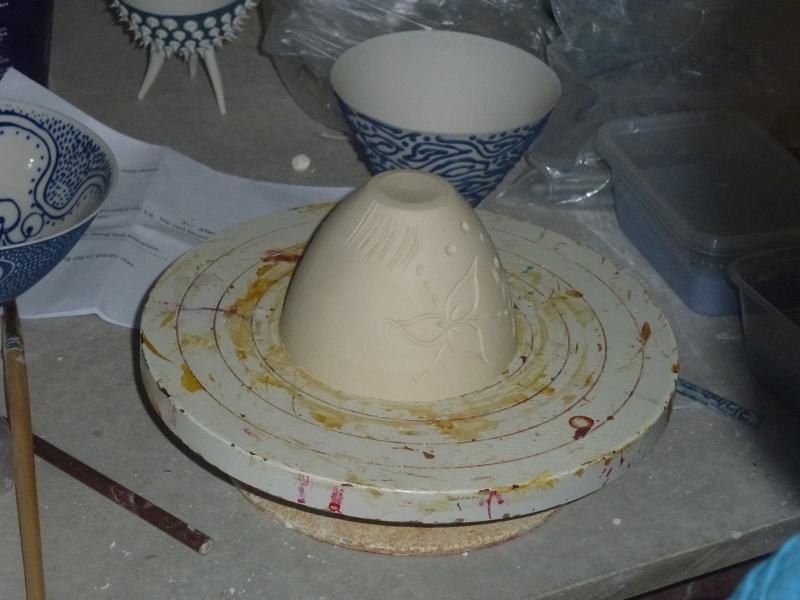 Use a plate divider to mark out your grids. Shellac can be used to make a resist to allow for sponging the clay back. Shellac fires out at about 200c. 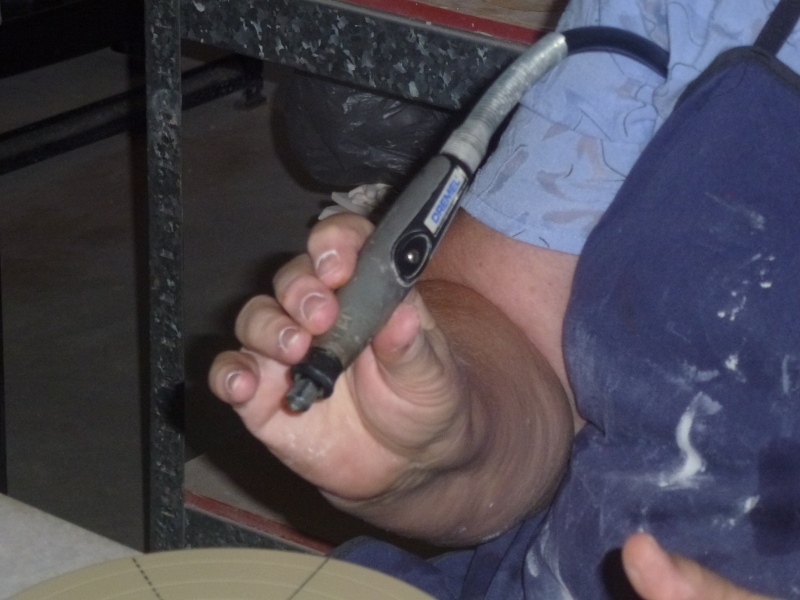 There are a number of drill tools available but Julie favours the Dremel drill. 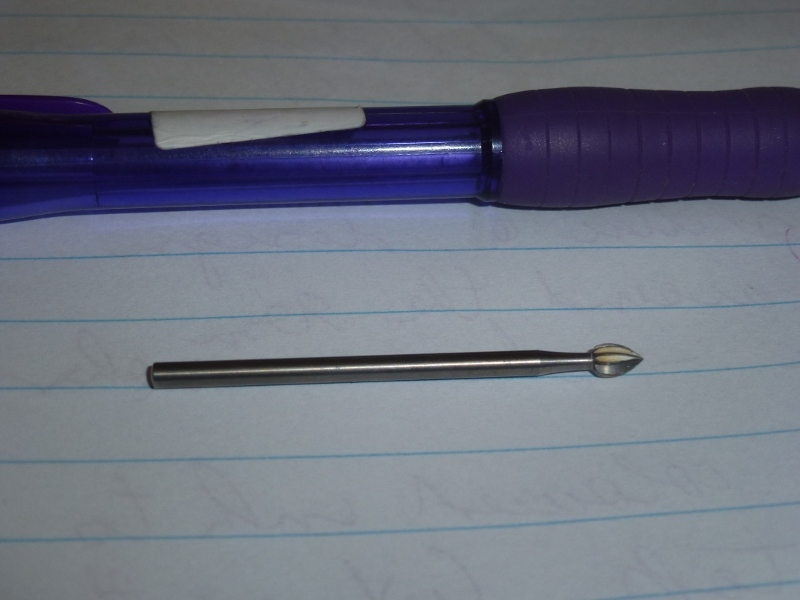 The drill bits (buds or burrs) are available from Australian Jeweller Supplies. 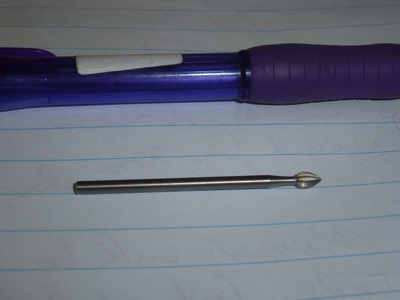 Drill sizes from 8 (super fine) to 14/16(fine) are used. Fire in the bisque to 960c and polish by sanding wet with Wet & Dry sand paper. Starting with 400 grade and then to 600 grade. 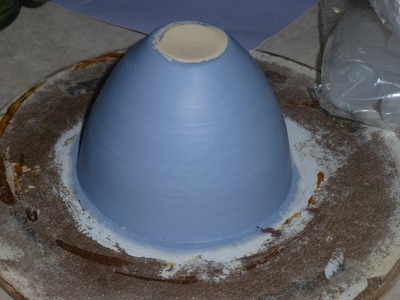 Final firing to cone 9 (1280c). 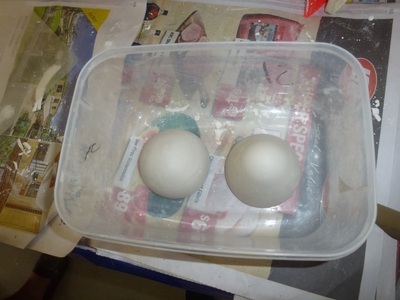 To achieve good translucency take about three hours for the last 100c. Use Potters Plaster, bought from Boral or CSR. 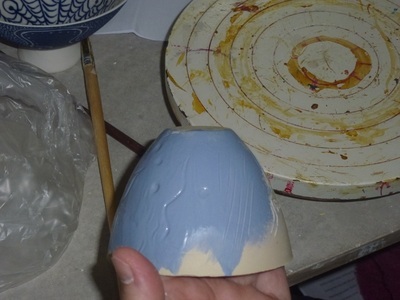 Make the original model out of solid clay. 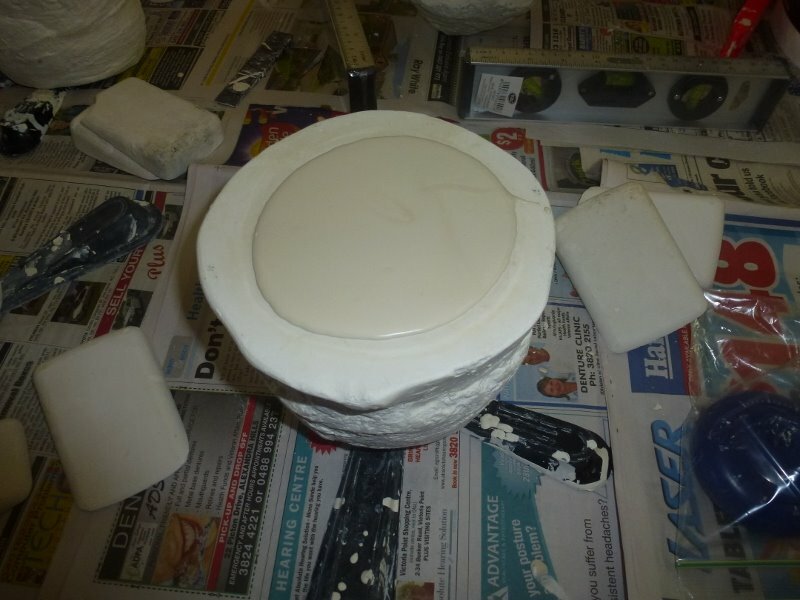 If the mould is to be used for slip casting porcelain use a cheaper white clay so that the mould does not become contaminated with iron from the clay. Models for moulds can be made out of wood, plaster, or found objects. 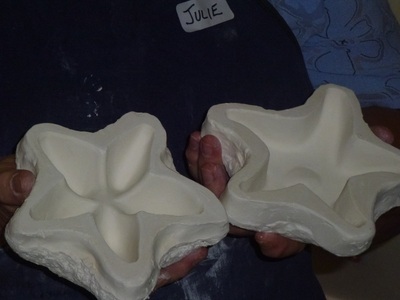 Cottles are the surrounds which will contain the plaster around the model when making the mould, and can be made out of clay or anything that will make a suitable shape around the model. 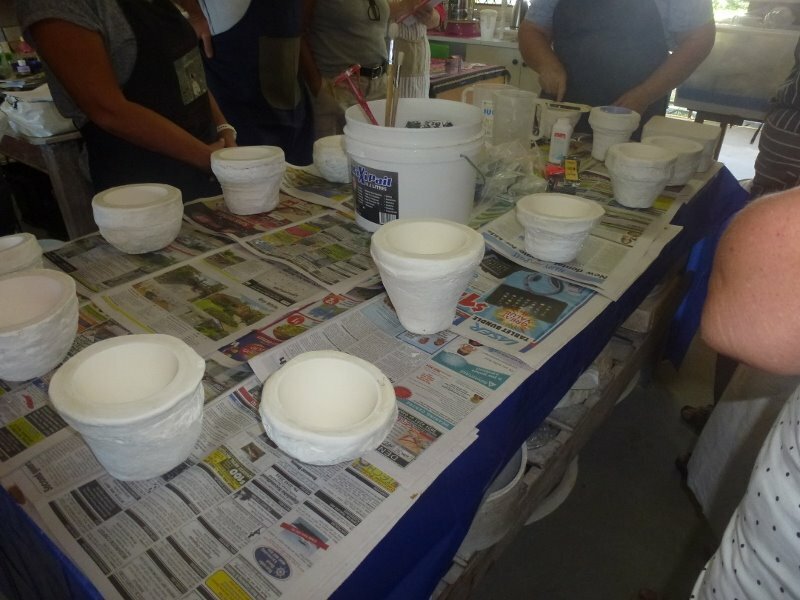 A good separator between the model/plaster and pour of plaster is made up of equal quantities of vegetable oil and dish detergent. 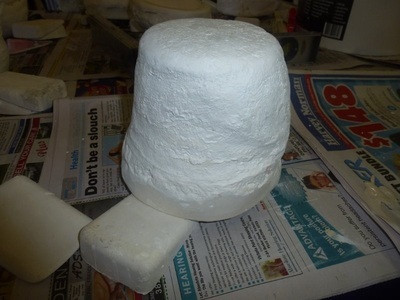 Brush all over the surface against plaster, wipe off the mould surface before drying it. 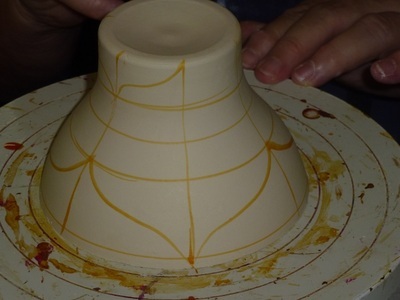 Slips can be thickened with ATP-II Porcelain–Stoneware enhancer. 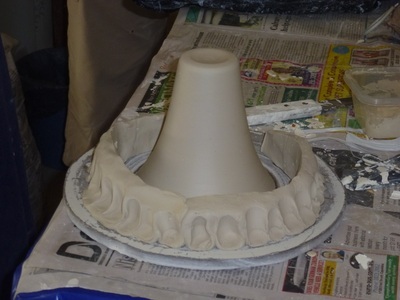 This makes it easy to use in a slip trailer to thicken/squeeze out of the slip trailer in the consistency required. 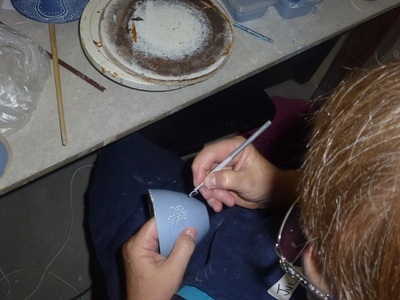 There are a number of carving tools that can be used to carve into the clay, then add slip painted onto the carving, building up the thickness until the carving areas are filled in. 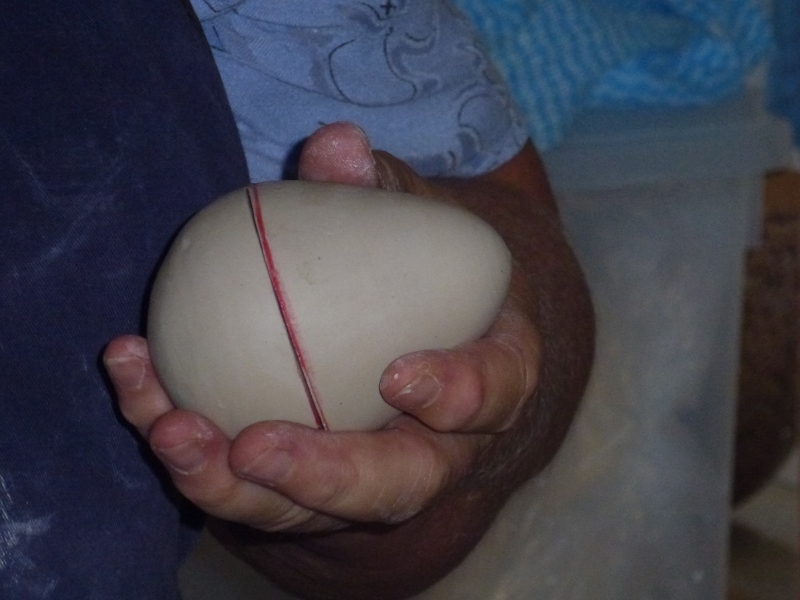 When they dry to a consistency to allow for scraping off the form, do so, leaving the coloured slip in the carved areas. You can also paint on coloured slips, then carve into the slip with the carving tools.